Entertaining Theories + RECIPE: Build Your Own Spring Roll Party! I have two very distinct theories on entertaining. Theory number one is that parties are for spoiling guests. I want them to walk in the door and get a home brew thrust into their hand immediately. I want good music playing and good smells coming out of the kitchen. In this theory I will probably greet people while still wearing my apron. Yeah, no, that’s a definite. In this theory, I will definitely greet people while still wearing my apron. The table will be set. The fridge will be stocked. The food will be prepared and/or cooked before anyone pulls into our driveway. Guests will nibble up two or three courses (dessert is never optional in my house) while talking happily and no one will have to lift a finger. Theory number one is kind of the gold star of hosting. It’s the old expectation and norm for what happens when you are invited over for dinner. It’s perfect and elegant and absolutely has it’s place. Theory number two is very different. Theory number two is less about spoiling and more about sharing the whole food experience from prep to plate. It says we’re about to share food so let’s share the work in preparing it too! Theory number two takes into account that parties are supposed to be fun for everyone and that includes the host! There’s less stress and more time to actually play with the food together. It’s kind of like a potluck, but even more fun! In theory number two, guests walk in the door with beer in hand. Someone might have even brought the spring roll wrappers or peanut sauce. Work and expense are divided among friends. Everyone stands around a table or counter (kitchen islands are ideal for share-the-work parties), all in aprons, each with their own cutting board, dicing and cutting and roasting and mixing. Guests drink while they dice. They talk while they cook. If things need to go in the oven for an hour, everyone retreats to the living room and talks some more. When the food is ready, everyone sits around a table and shares the food prepared together. It’s beautiful. It’s a completely different style of party than the one in theory number one. It’s far less formal, but it’s also far more educational. People not only share food, they share cooking techniques. Friends learn from each other. Friends talk about food in new ways. As a farmer and lover of food, I absolutely love the time spent with friends while dicing vegetables. It is truly one of life’s simplest pleasures. My one disclaimer for share-the-work parties is that you need to be a pretty confident cook or to choose a concept you are very confident with. If you are new to cooking, definitely don’t host a share-the-work party with a new recipe while trying to hold a conversation and drink beer and chop something. You are sure to lose a finger. Make something you have made a million times before. Or just supply the ingredients and the counter and have a more-experienced-with-food friend lead the prep work. I (obviously) love to throw both kinds of party. I think there is a time and a place for both. If you are having 5 people over who don’t love to cook, well then probably don’t make them done an apron and dice onions. If you are having a couple over who works 12-hour days on their feet and they just want to relax and share good food with good friends, well then absolutely spoil them! If you are having a double date with a couple who has always wanted to learn how to make pasta or pie crust or pizza dough from scratch, then have them over and have them help! It’s a tried and true rule for entertaining: plan a party your guests will like. Build-your-own parties are the perfect in between. They are absolutely, without a doubt, my new favorite thing to host! They are low key. They are simple. 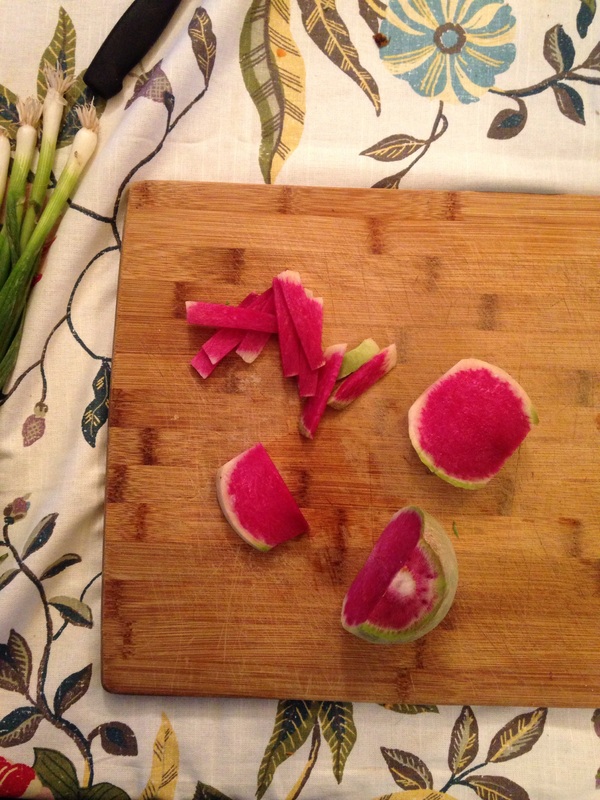 You can do the prep work ahead of time (aka vegetable dicing) or you can do it all together. Either way, the only commitment from the host is to fill bowls with lots of toppings and let people go crazy making their own pizza, pasta, sushi, taco, grilled cheese, spring roll, etc. There are tons of options for vegetarians or gluten-free folks or picky eaters. Plus everyone gets to feel like they’ve created something without requiring too much effort. I am absolutely obsessed with build-your-own parties!!!! 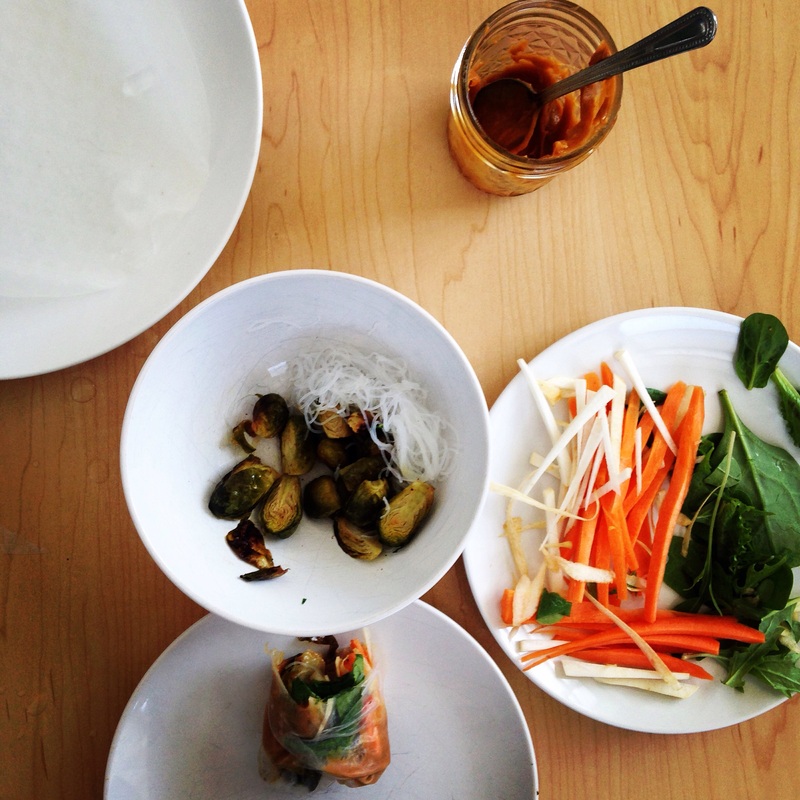 This past weekend I hosted a build-your-own spring roll party with my bestest friends Dena and Jamie. Mr. Carrot was there too but I let him skip out on the prep work. For this shindig, I did zero advanced work or planning. I always have spring roll wrappers. I always have vegetables. And I always have Asian pantry items on hand. I bought some lettuce and some mint (non-negotiables in my spring roll opinion) and that was it. My friends came over and we just got to dicing. It was perfect and colorful. It was light and refreshing. It was the very happiest of Friday nights. My recommendations for what to have on hand for a build-your-own spring roll party (and a couple sauce recipes) are below! Lots of love as we head into this (finally) warmer season! P.S. Like this fun party menu? 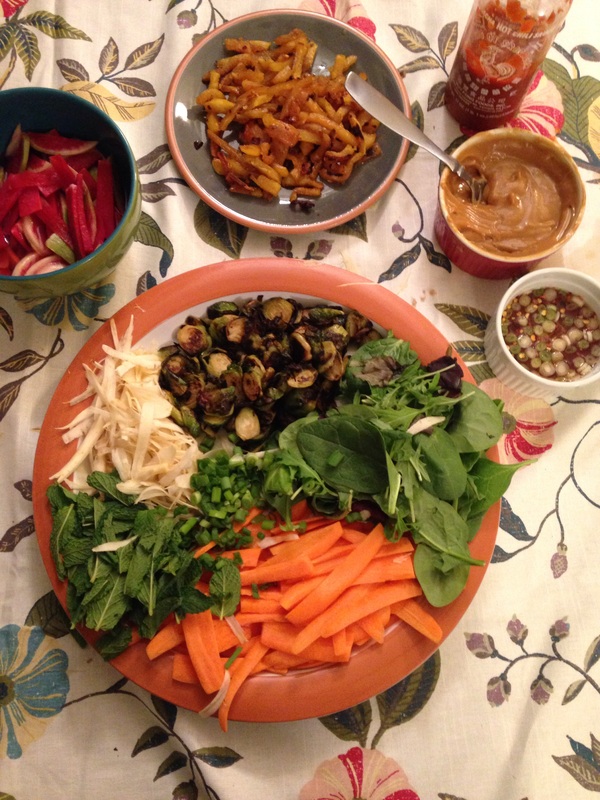 You’ll love my blog post on our cookbook potluck club! BUILD YOUR OWN SPRING ROLL PARTY!! The directions below are for exactly what we used at our spring roll party, but again, it’s just what I had on hand in my fridge. Honestly, the sky is the limit when it comes to spring rolls! You can put anything in there and it’s going to taste delicious. Get creative! Have fun! Have too many options available for your party and figure out that day what works and what doesn’t. A spring roll party is a no pressure kind of party! Meat is a great optional add-in to think about too. 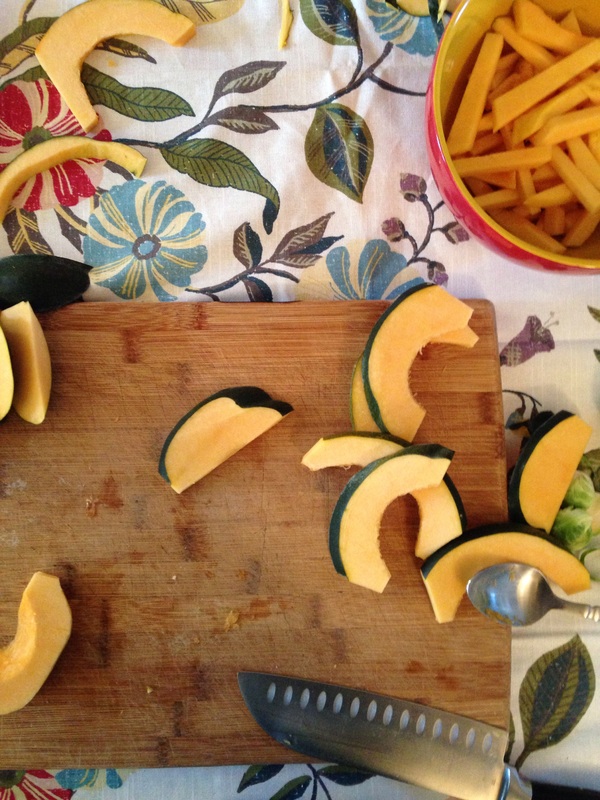 In this recipe, I used acorn squash as my faux meat. I almost never put meat in my spring rolls mostly because spring rolls are my solution to too many summer veggies (CSA farmer problem) but so many meats would be delicious. Shrimp is common and oh-so simple. Chicken is another simple option. I’ve always thought pulled pork with minimal seasoning (or Korean BBQ flavors) would be delectable. I think both tempeh and seitan would be spectacular options to have available if you have vegetarian friends but want a little extra protein and flavor in there. When it comes to spring rolls, abundance is key. They are light so people might have one or they might have four. It’s anyone’s guess. I always over prepare the filling ingredients because if they don’t get eaten, I’ll just have a super yummy salad the next day. 1. Prepare all veggies (and meats) desired. 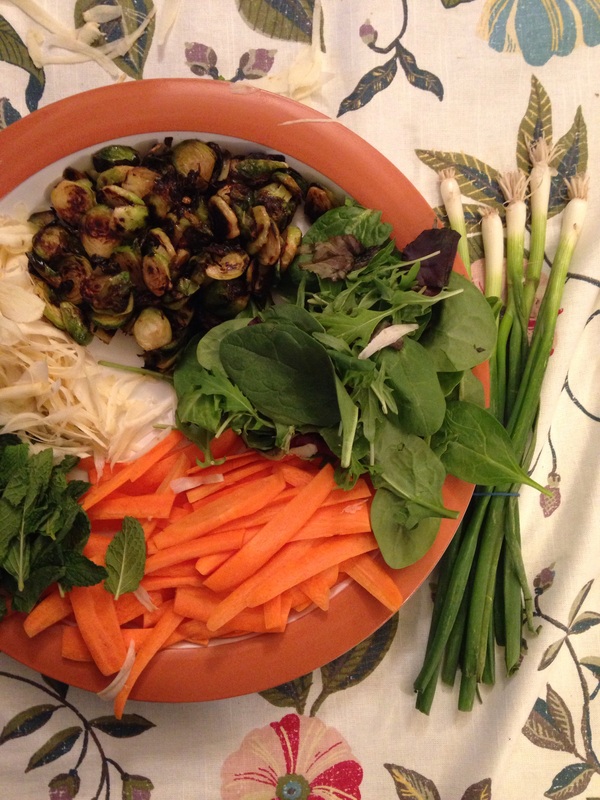 My best recommendation is about 1 cup of vegetables (excluding spring mix) per person eating. But again, dicing too much is really not a problem. Leftover prepped veggies are so usable! 2. Mix together any sauces (see suggested recipes below). I typically do one batch of each for a party of 4-6 people. 4. Put all prepped ingredients into bowls on counter or table. 5. 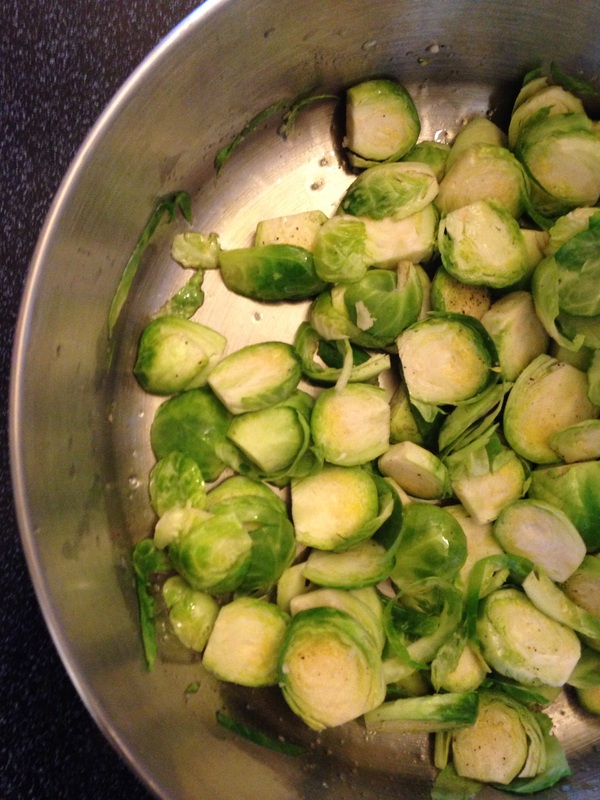 Fill a pan with 1 inch of warm water and place on counter. This will be where you dip your spring roll wrappers. A 9-inch cake pan works perfectly. 6. Dip spring roll wrappers in water for 10-20 seconds, until soft and pliable and transfer to your dinner plate. This will work easiest if your plate is a little damp. 7. Fill spring roll with ingredients of your liking. I usually do a little noodles, a little spring mix, a little herbs and then 1-2 veggies. Usually you will dip the spring roll, but sometimes I put the peanut sauce inside of my spring roll for ease. 8. Wrap up your spring roll! Fold up the bottom first, then the top, then one side and then kind of roll it to seal. Here’s a little basic tutorial with pictures! It will take a while to get the knack for it. Accept that and just keep trying! Mix all ingredients together. Adjust seasonings as desired. Next Post 6 months married!!! Love both your entertaining theories, I wish I was able to host a number 2, but I can’t I think I am too nervous for that! Start with a build your own concept for a small group of people!! You may just never go back! They are so much fun!!!! I recommend flatbread pizza bar as a great intro party 🙂 so easy! Thank you for your recommendation, I will try!